"The Knights of the Orange Tail"
This AirDOC publication is presented in soft cover with full colour glossy pages in A4 format. 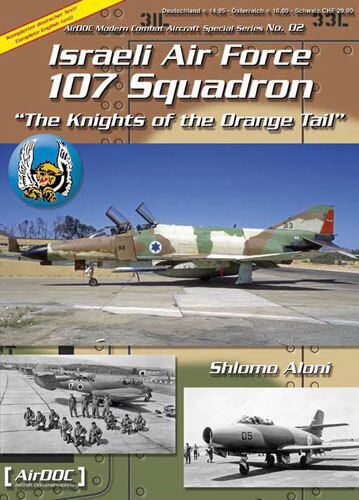 The book covers the Israeli Air Force No 107 Squadron and contains many photographs of the Spitfire Mk.IX, P-51D Mustang, Meteor Mk.8, Ouragan, and F-4 Phantom. The publication contains 64 pages of German and the equivalent English text with approx 118 colour photographs depicting No 107 Squadron aircraft both in peacetime and combat. A brief history of each is provided including combat reports and squadron information. A lot of information is included covering the early days of operation leading into the Yom Kippur War. Many combat reports are included including gunsight camera stills and reconnaissance camera stills of ground attack missions. A fitting touch is a foreword by Ran Goran who was the Commander of No 107 Squadron from December 1973 to July 1975. The foreword leads into some squadron history before getting into the specifics on squadron operations, pilots, and aircraft. In summary, this is quite a comprehensive and nicely illustrated publication and will be a welcome addition to the collection of any person or modeller wanting good reference detail for the Israeli Air Force.